When you’re considering purchasing a sublimation system, you probably concentrate on the big things, printers, paper and ink, and perhaps forget the small things that can make sublimating an item so much easier. Since it’s easy to forget you might need heat tape, or a mug wrap, I thought today would be a good time to remind you that EnMart carries a variety of accessories for sublimation, and to discuss which accessories might be useful for which disciplines. Wraps – Wraps are used for items that are oddly shaped or too large or small to fit comfortably in a heat press. They are also useful if a large quantity of an item needs to be produced. Many people, for instance, use mug wraps and a large oven to produce large quantities of mugs. Shot glasses are too small and fragile to go in a press, so they are sublimated using a shot glass wrap. There are also wraps for bowls and other items that can’t be sublimated with a press. Name badge attachments – EnMart sells a variety of name badges, but those badges won’t do you any good if they can’t be attached. We offer magnetic attachments and safety pin attachments. 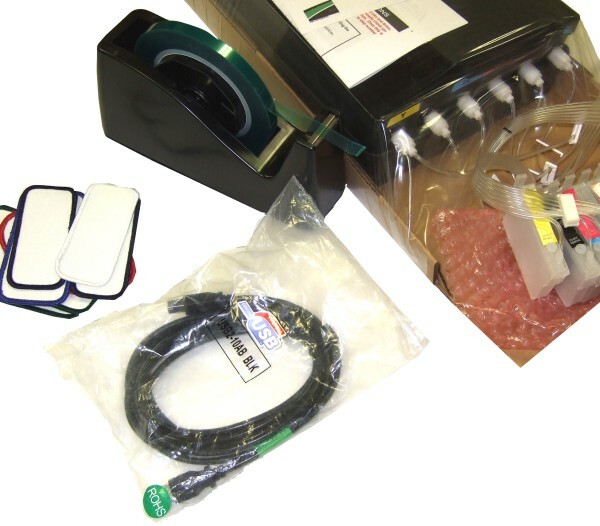 Bulk Ink (CISS) Kits – If you prefer to work with bulk ink, CISS kits are your answer. These kits contain hardware only, and can be used with the Sawgrass bulk ink bags. CISS kits are available for the Workforce 1100 and the Epson 1400. Waste Ink Collectors – Over time the waste ink collector that came with your Ricoh printer will be full. When you need to change out your waste ink collection unit, EnMart has them for the Ricoh GX e3300N and the Ricoh GX 7000. Sublimation Heat Tape – Holding transfers in place so they don’t slip or slide is important and heat tape is often a necessity for hard goods like mugs or tiles. If you use the handy heat tape dispenser EnMart sells, you’ll always be able to find your tape easily. Heat press options – Don’t forget that you need to protect your heat press as well. EnMart offers a variety of options for protection as well as items to enhance the usefulness of your heat press.